This is a beautiful rug at an incredible price. The color is very vibrant I got the blue. It looks like a more expensive rug. I would recommend this rug. The Premium Collection features traditional and contemporary patterns at incredibly affordable prices. Enjoy the unique styles and rich colors from this impressive collection. These rugs are machine wove of 100-percent Olefin yarn for durability and easy maintenance. They are the perfect choice for today's active households. Exact Size: 7'8" x 10'7"
I bought this rug to go under the dining room table, It is soft, low pile, and the color is a dark emerald green, which is what I wanted. It looks nice on the hardwood floor, I would advise a rug pad so it doesn't slip around. I was not really pleased with with the colors of the rug or the quality. I have pets and change my area rugs quite often and am always looking for a rug that is of decent quality quality but yet inexpensive. Unfortunately while this rug was inexpensive I was not impressed by its quality. Love the colors in the rug, they go great with my living room furniture. The size is perfect, but the material used to make it is very cheap. I have had it for 6 months now and it still won't lay flat yet and don't think it ever will. My husband and I are always tripping on it! Rug is very nice looking. I've had it for a few weeks and the only problem is that the lines from being rolled up haven't flattened out yet and it doesn't lie flat. But, overall, good quality. Makes any room look good! Very nice rug fit perfect under dinning room table .love it remember to get the backing so it will not wrinkle or roll. 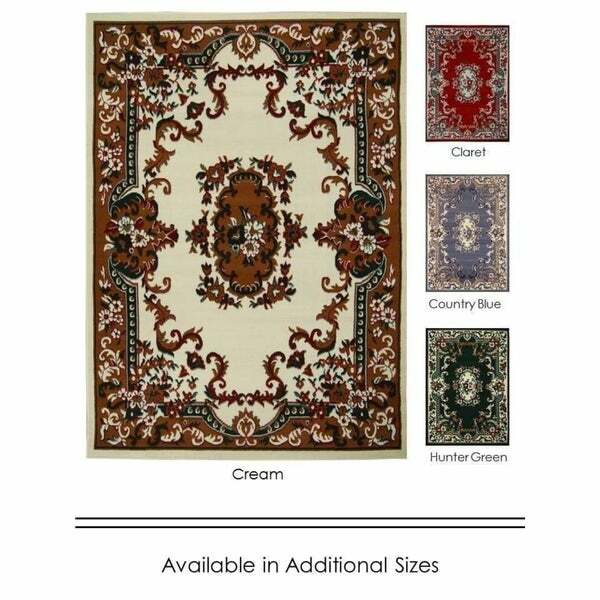 I have purchased many rugs on overstock and this is one of the worsts. Was not even worthy the effort to return, I just donated it.